Votualevu Tirath Dhaam Mandir mandir caretaker Raponi Turuva points to one of the newly installed CCTV cameras. Photo: Arieta Vakasukawaqa. “We have invested in CCTV cameras, we have put up burglar grills, we have repainted and replaced all our dieties that were desecrated during the robbery,” said mandir secretary Shiu Chandra. Officials of the mandir that was desecrated in Votualevu last month have put up security measures to protect it from being robbed in the future. 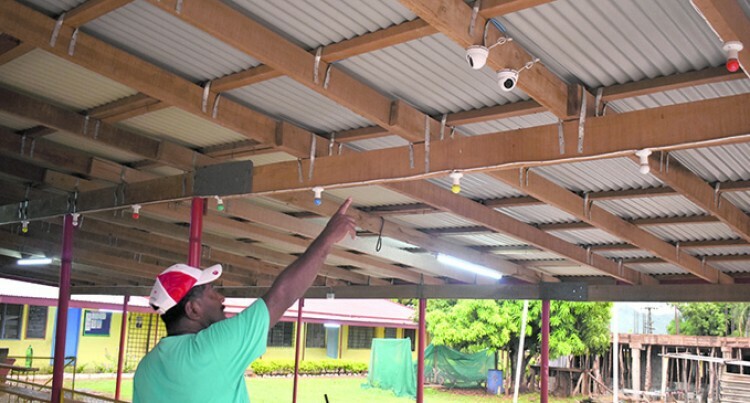 Installing closed-circuit television (CCTV) cameras, putting up burglar grills and other security measures is all part of the operations that the committee of the Votualevu Tirath Dhaam Mandir have done to help secure their temple. And Secretary Shiu Chandra said they have decided to take extra caution now because this is not the first time their temple has been robbed. “We have invested in CCTV cameras, we have put up burglar grills, we have repainted and replaced all our dieties that were desecrated during the robbery,” Mr Chandra said. He said that Police have yet to apprehend whoever committed the offence. “We checked with police and they said that they have not found anyone yet. We will continue to work on securing our temple and making it a safe place where members can come to worship in peace,” he said. The desecration of the temple drew coverage from local and overseas media and condemnation from religious groups who called on the authorities to ensure that all religions are respected.